Next year Vostochny Port will complete its ambitious expansion project, which enables it to increase the throughput to 39mtpa (million tonnes per annum) in 2019. A new stage of the Russian largest coal terminal will be put into operation in autumn 2017. More than 60% of the overall throughput of the port is provided by Carbo One Ltd., which is the largest supplier of high-quality steam and PCI coal from Russia with annual sales of about 50mt (million tonnes). Currently,Vostochny Port is not only investing in modernization of coal-handling equipment already installed in the port, but also implementing the project for further expansion of the current capacity. The expansion of the Specialized Coal Terminal has been the largest and most ambitious project being implemented in Russia for the last 25 years. Along with the development of the railroad yard of Nakhodka-Vostochnaya station, it will enable the port to increase its annual throughput to 39.0mt in 2019. The expansion includes a railway station, two railcars heater facilities with a total capacity of 80 railcars, two tandem railcar tipplers, a system of conveyor lines, four reclaimers, two stackers, four coal storage sites with simultaneous storage capacity up to 750,000 tonnes, a deep-water birth of 385m long and draught of 16.5m and two highly efficient shiploaders. 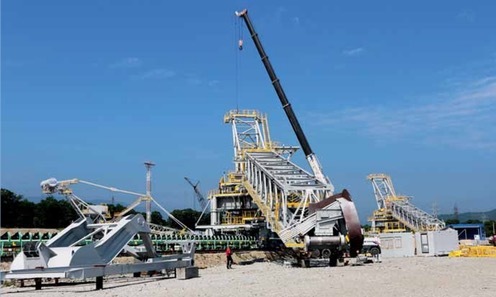 The conveyer belt system is designed to link up the existing conveyer belts of the Specialized Coal Terminal with the new ones, creating a joined-up system. After the expansion it will be possible to distribute the arriving coal between the existing and new storage areas subject to cargo owner’s instructions, significantly improving the efficiency of handling operations. It will be possible to store up to 1.6mt of coal at the terminal at any given time. Vostochny Port is equipped with a high-tech magnetic decontamination system. Electric magnets are located on transfer towers — at the point where moving coal is poured from one conveyor belt to another and where they are the most effective in terms of the removal of metal contamination.This guarantees the highest quality of magnetic cleaning of coal from any metal impurities. After discharging from railcars, coal passes through the multistage magnetic cleaning system before loading onto a vessel. Depending on the location of coal, each tonne will pass through 9 to 12 magnetic stations with a capacity up to 2,100 gauss and weight of 12–17 tonnes each. These are the most powerful magnets available on the market by now. Four magnetic drum separators installed in Vostochny Port significantly improve the quality of coal cleaning from metal contamination. The drums are set at the ends of the conveyer system. The magnetic drum attracts metal impurities thoroughly because of its immediate proximity to the conveyer belt and the flow of coal. The effective area of the magnetic field of the drum extends at a distance of 0–150mm from the surface of the magnet with the capacity of magnetic induction up to 2,100 gauss. Even small parts of metal contamination are removed from coal on this stage of cleaning. Under magnetic field of the drum, metal impurities remain stuck to the surface of the conveyer belt. After passing over the drum, contamination free coal pours from one conveyer belt to another, but metal impurities keep moving along with the conveyer belt around the drum until being automatically removed to the receiving tray. Altogether the terminal has 34 modern high-tech magnet stations. When the expansion of the Specialized Coal Terminal comes into operation the total number of magnet stations will be increased up to 65 units. Vostochny Port is an eco-friendly company. Modern technologies are applied to ensure environmental protection and health care. The port is equipped with a highly efficient air purification system which removes coal dust from the air.The effective stockpile irrigation system prevents the spread of dust in the air. Water treatment facilities installed at the port are compliant with the international standards and provide day-today environmental monitoring and auditing. Sustainability is one of the key elements of corporate strategy of the port which not only strives for prosperity and success in business, but also is committed to minimizing the impact of its operations on the surrounding environment and community.